Think you’ve got it together? Well, you might want to take a look at this before you start congratulating yourself on being productive and having your life in order. We transcribed this page of Benjamin Franklin’s daily schedule from 1776. Just look at all the stuff the famous inventor and Founding Father managed to get done in a single day! 2:00 AM: Wake up early, as is the Benjamin Franklin way. 2:00 AM-2:15 AM: Invent shower. 2:30 AM-3:00 AM: Wake up the fair city of Philadelphia by wheeling a cannon out into the street and firing it loudly over and over again so that all the good citizens of this glorious city may get an early start on their morning’s work. 3:00 AM-3:15 AM: Invent breakfast. 3:15 AM-3:30 AM: Eat a hearty breakfast consisting of a herring skeleton and a wooden engraving of a bee. 3:30 AM-4:00 AM: Go to work at the printing press. 4:00 AM-5:00 AM: Print thousands of large pieces of paper with the word “INDUSTRIOUS!” written upon them and distribute them all about the streets of Philadelphia, so as to inspire the good citizens of this glorious city to always be industrious and efficient. 5:00 AM-5:30 AM: Travel from Philadelphia to Paris. 5:30 AM-6:00 AM: Rally French support for our American Revolution by writing “England” on a snake and releasing it into the streets of Paris, thus demonstrating through metaphor the perfidious nature of King George. 6:00 AM-6:15 AM: Return to Philadelphia. 6:15 AM-6:30 AM: Take two naps at the same time in order to maximize efficiency. 6:30 AM-7:00 AM: Invent bifocals. 7:30 AM-7:45 AM: Invent a very small glove. 7:45 AM-8:00 AM: Go to my job at the post office as Postmaster General. Begin the Postmaster General’s sacred duty of writing a letter to every single American citizen informing them that I am proud of them. 8:00 AM-8:30 AM: Be generally efficient. 8:30 AM-9:30 AM: Affix a brass key to a kite string and send it aloft in a thunderstorm as part of my frantic quest to pump my body so full of electricity that I erupt into a glorious ball of fire. 9:30 AM-10:30 AM: Repeat kite experiment, replacing the key with a shrieking boy from the neighborhood. It is my hope that the boy, when affixed to my kite string and sent into the sky during a lightning storm, will prove a more efficacious conductor of electricity than the key and thus aid me in my quest to cram my body so full of electricity that I burst into flames. 11:00 AM-11:30 AM: Walk into John Hancock’s house uninvited and shout “efficiency!” repeatedly and continuously until the honorable Mr. Hancock forcibly removes me from the premises. 11:30 AM-11:45 AM: Whisper “Time is money” to a bird. 11:45 AM: Go to sleep early, as is the Benjamin Franklin way. No dreams. Wow. 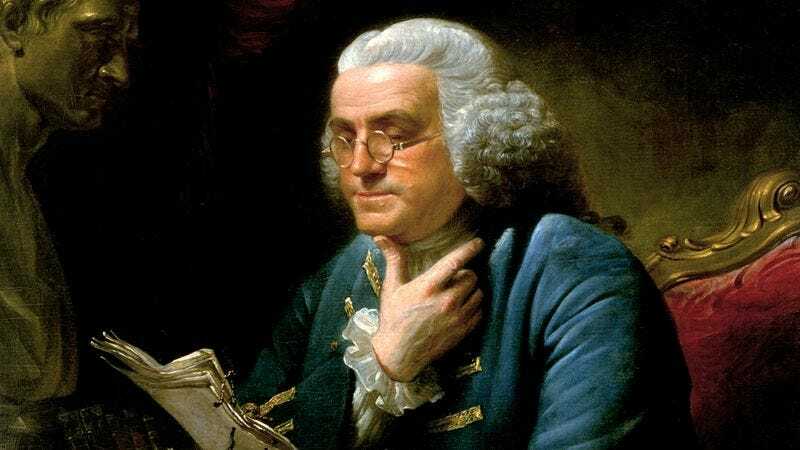 Next time that you start to feel accomplished simply for going to the gym or paying your rent on time, just remember that Benjamin Franklin could have accomplished twice as much before the sun came up. Compared to him, everyone looks like a hopeless mess!